Five is our lucky number! We’ve just received the Forbes Five-Star award for the fifth consecutive year. Forbes Travel Guide offers the only independent global rating system for luxury hotels, restaurants and spas. We’re truly honored to be part of this prestigious family who strives for hospitality perfection – opting to be judged on 900 objective service standards every year. 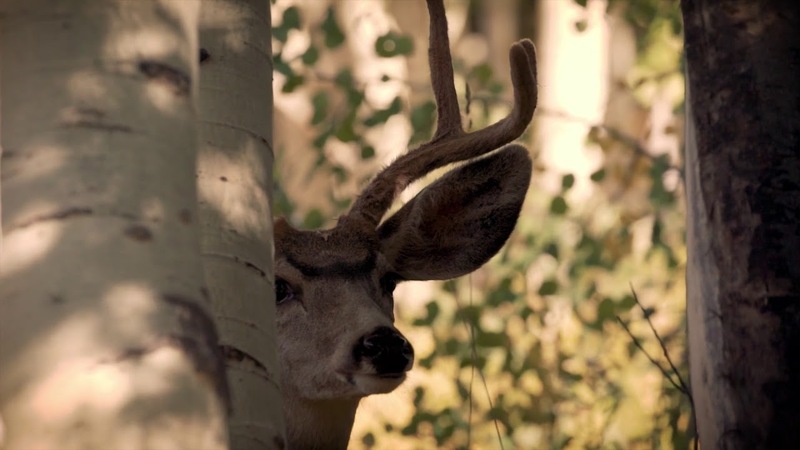 Photo by Lead Ranch Shooting Instructor Myron Weirich. 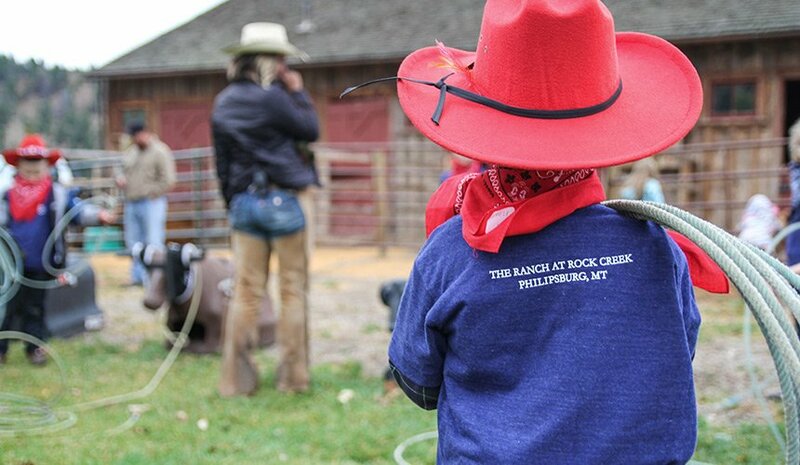 While many of our buildings are well over a century old, The Ranch at Rock Creek is a young property, and we want to thank our former and current Ranch staff for helping us earn this distinction for five of our eight years in operation. 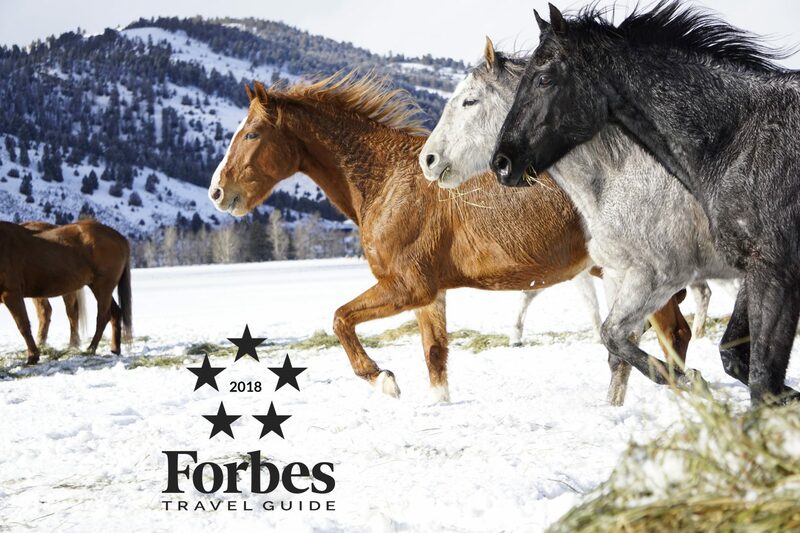 We also want to join Forbes in welcoming two of our Montana neighbors into the Forbes Travel Guide family for the first-time. This year, Triple Creek Ranch, another Relais & Châteaux property, earned four stars and The Resort at Paws Up was given Recommended status. Congratulations friends, on these big achievements. The Treasure State is shining even brighter after this year’s award announcement. We are honored to be part of the Forbes Travel Guide Five-Star family because families with high-standards and a love of travel are at the crux of what we do. From our inception as an all-inclusive luxury resort in 2010, we knew that the family travel experience was an essential facet of our outdoor-focused amenities. 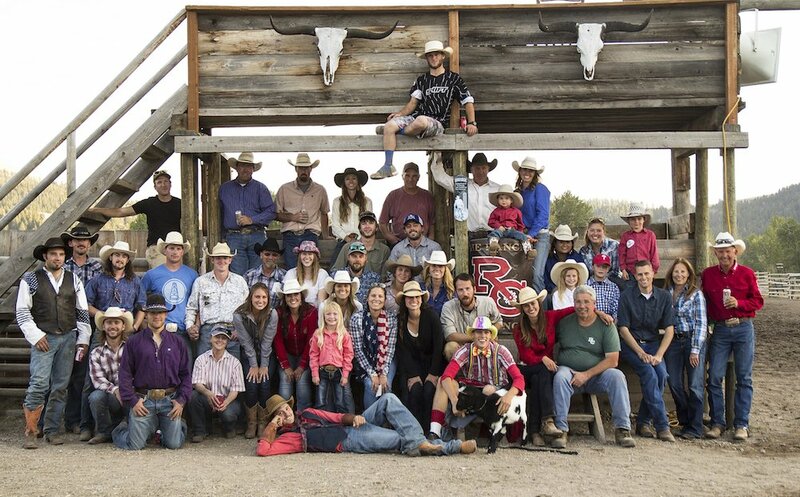 Though we love welcoming corporate retreats, elopements, bachelor/bachelorette parties and other generally adult-focused affairs, the versatility of being family-friendly allows us to ensure that every traveler can find their niche at The Ranch. (Unless, of course, they don’t enjoy the outdoors). Last year, we covered the new trend of multi-generational trips on this blog, including tips on making the most of a family trip. This time we want to hone in on why our carefully curated and outdoor-focused style of hospitality ensures memorable, inspiring and personalized family vacations. For adults, time in nature can reduce stress, boost immunity and inspire creativity. (If you’ve yet to experience it first-hand, take a look at the research in our forest bathing blog). However, outdoor play is even more critical for fundamental development in young children. When you let children play in the outdoors, you allow them to explore themselves and the world around them. They learn how and when to take risks to understand their physical, cognitive, social and emotional capabilities. In addition, children gain confidence in themselves, all while gaining a greater appreciation for the natural world that surrounds them. Kindergarten was invented by German educationalist and naturalist Friedrich Wilhelm August Froebel. He believed children should interact with each other and with the natural world at a young age. “Kindergarten” means “children’s garden.” In Froebel’s eyes it took on a double meaning. First, time in outdoors, or garden environment, was essential for early development. Second, “He believed that ‘children are like tiny flowers; they are varied and need care, but each is beautiful alone and glorious when seen in the community of peers.” (See full history here). Froebel’s kindergartens were widely adopted throughout the world; however, they have changed greatly for better or worse. Today, they are primarily held indoors. Now, there is a movement to bring children back outside. Forest kindergartens are extremely popular in the germanic world. They are also catching on in the US as research mounts that time in the outdoors, especially early on, has a variety of benefits; including enhancing problem solving skills, cognitive abilities, academic performance, nutrition, eyesight, social relations and discipline. (NC State University). 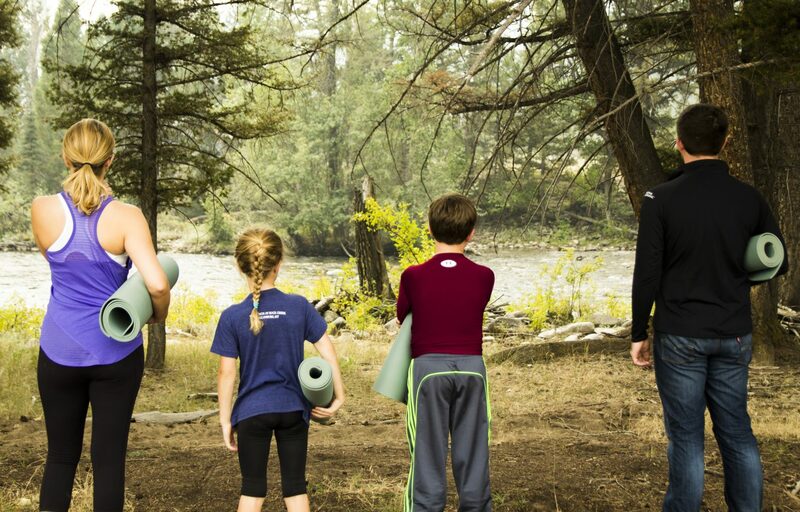 We encourage kids to interact with the environment through our Little Grizzlies Kids Club. The word “club” sounds like a place you can drop off your kids, but there is no one place or playground for kids at The Ranch. 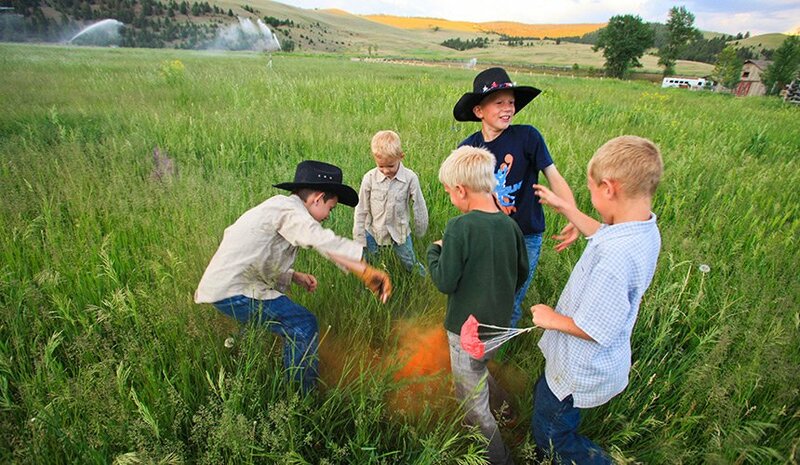 Our 6,600-acre ranch is their playground, and the Little Grizzlies program is a series of guided adventures that introduce them to the forest, river and barnyard in an inspiring way. Travelers aged 4 to 12 can join the Little Grizzlies while parents enjoy their own guided adventures. Then, families reconvene for meals and nighttime activities. 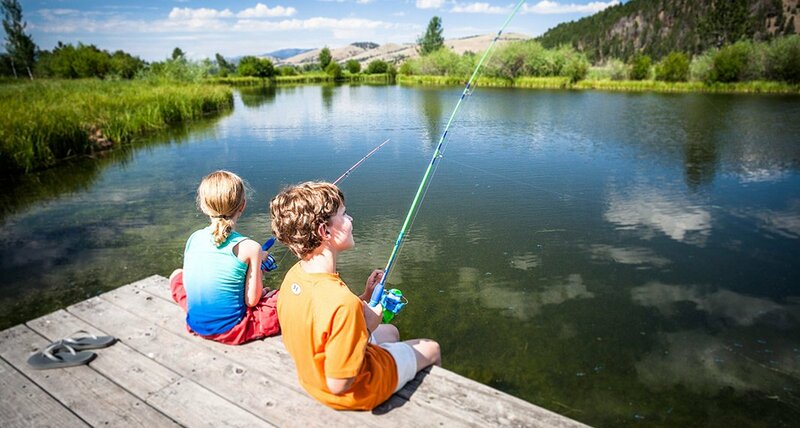 While families are welcome to stick together, the Little Grizzlies program is a tailored introduction to fly fishing, horseback riding, naturalist treks and geocaching. This personal attention, in tune with the specific age and skill level of a child, is more likely to spark a lifelong love of the outdoors. The Little Grizzlies Kids Club has a different focus each day, so children are introduced to many facets of our wilderness and culture throughout the average weeklong stay. One day they go on a nature hike and learn all about wildlife, like moose, eagles, elk, and deer. Another day, they learn about caring for horses, before enjoying a group ride and roping session. Read all about the different experiences in our Little Grizzlies program. 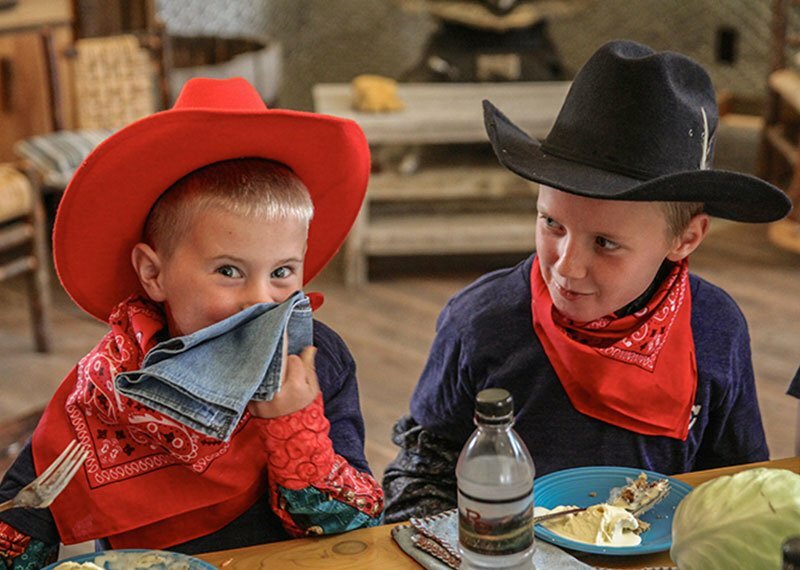 During our summer season and seasonal celebrations, kids also enjoy Little Grizzlies dinners in the Silver Dollar Saloon when parents dine on Executive Chef Drage’s tasting menus. This way, parents can enjoy more adventurous culinary pairings and kids eat a meal that’s designed for younger palettes along with an interactive component. Little Grizzlies is anything but babysitting, but we do also offer babysitting for an additional cost by prior arrangement. Ranch Ambassadors work with each family to include the Little Grizzlies program as they see fit. In addition, our Little Grizzlies coordinators are working hard on expanding the program to include a “Little Grizzlies Den” and adventure course that uses natural elements to introduce physical and problem-solving challenges to our youngest travelers. Stay tuned to the blog to receive more information on this and other 2018 additions. One of the essential parts of being family-friendly is simply being friendly. With Forbes Travel Guide’s algorithm being heavily weighted to service, we know that our staff are mainly responsible for our high ranking. 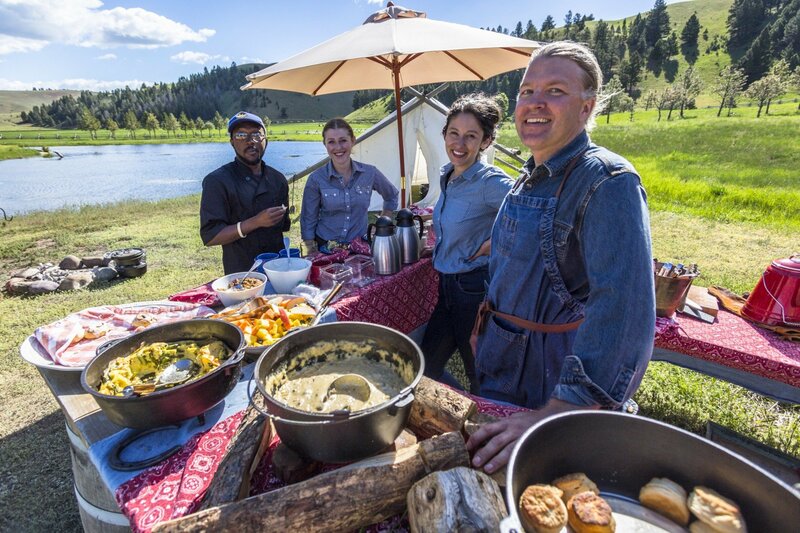 Executive Chef Josh Drage and Catering and Groups Manager Christina Wernikowski serve a Dutch oven breakfast. Instead of trying to conduct ourselves like a metropolitan hotel, we adapt luxury standards to our local area. Homestead hospitality centers on helping our guests feel like they are one of our family when they stay here. This is evident in our included adventures, accommodations and aliments. 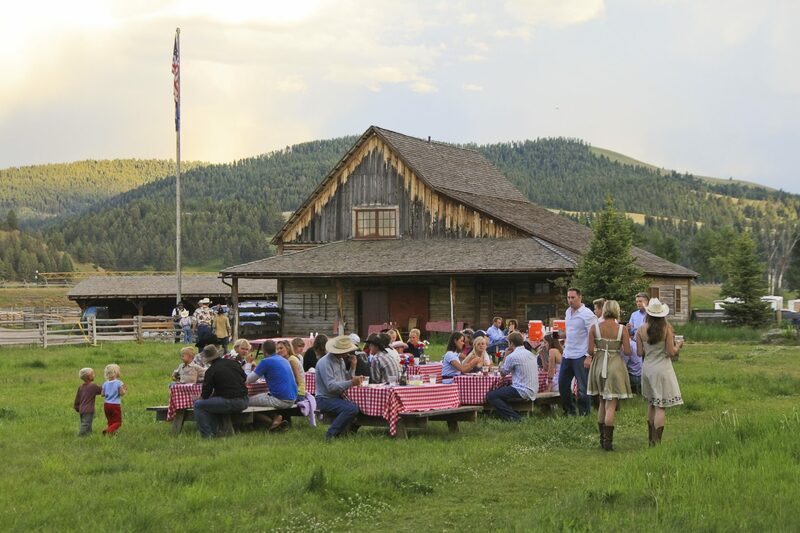 From our Homestead Supper Club dining experience, which evokes the tradition of Montana supper clubs as a local culinary luxury, to our more traditional Ranch dinner and wood fire grills, there’s always a taste of the family ranch and farm-to-table origins in our dining rooms. Ranch Manager Joe DeMers with his son Bronc. This spring we’re adding a new experience, called Behind the Chutes, where guests will learn all about our working ranch, haying, horse herd, cow herd and weekly summer rodeos. 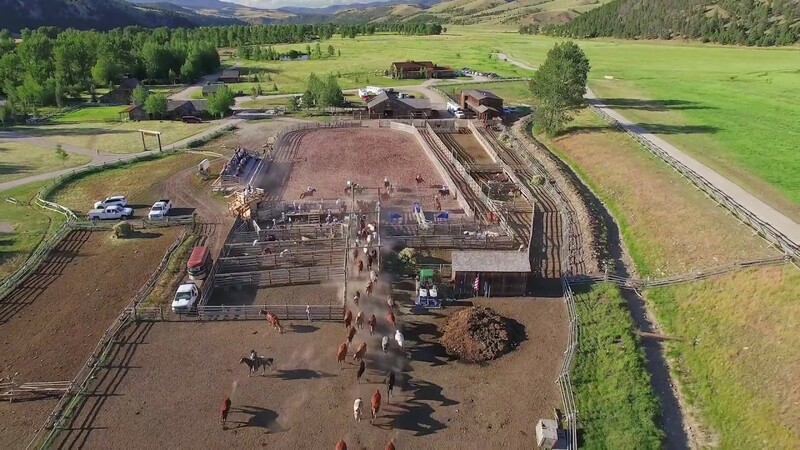 This behind-the-scenes look into Montana ranching culture will help guests understand our property and the ranching lifestyle in Granite County, Montana. We think this will be an engaging addition for guests of all ages. The ultimate goal of these and our all-inclusive events and experiences is that families feel comfortable, engaged and relaxed at The Ranch – a perfect home away from home. 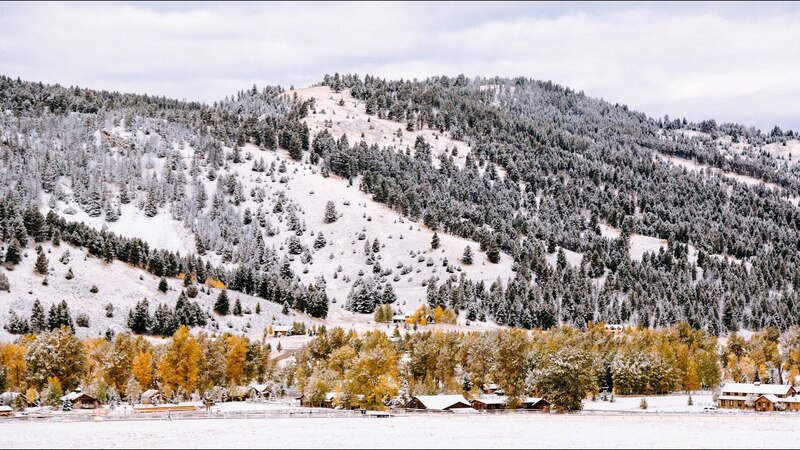 In addition to year-round family vacations and reunions, The Ranch plans seasonal celebrations, like Memorial Day, Thanksgiving, Christmas and New Year’s, for families looking for a stress-free holiday.